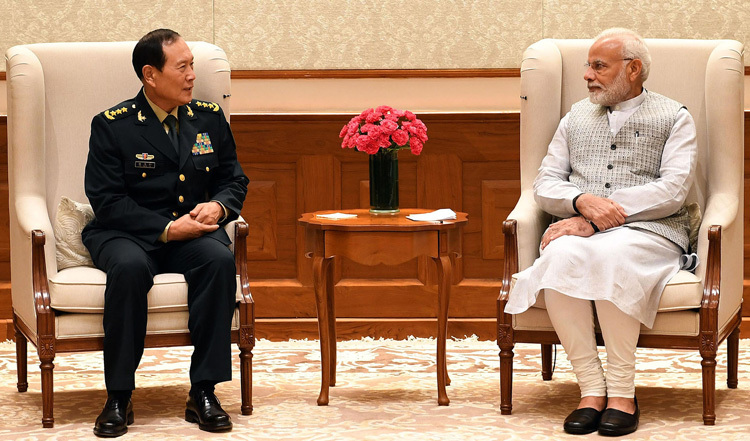 The Defence Minister of China, General Wei Fenghe calling on the Prime Minister, Shri Narendra Modi, in New Delhi on August 21, 2018. Commenting on multiple transgression by the across the Line of Actual Control (LAC) including a major one in Sikkim post the informal summit in Wuhan between Prime Minister Narendar Modi and Chinese President Xi Jinping, Claude Arpi, expert on Tibet and India-China relations wrote in his article titled 'The Curious Case of Demchok', "The 'spirit of Wuhan' had clearly been forgotten. One could ask: Is President Xi suffering from amnesia or is a local commander not aware of the 'consensus?' 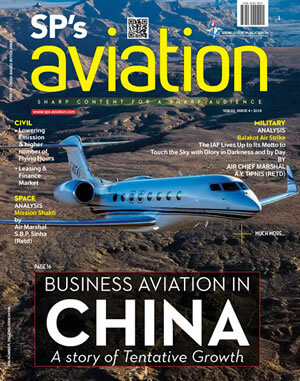 The latter would mean that Xi has not full control over the PLA, which is serious matter". But it is well known that having accumulated total power unto himself, not only does Xi have absolute control over PLA but must be approving and monitoring each and every transgression in his design of keeping India under pressure. It is just the Chinese way of blow hot, blow cold to keep the opponent guessing what their real intentions are. However, in what is being described as carrying forward the spirit of Wuhan, Chinese Defence Minister Wei Fenghe made a four-day visit to India last month; August 2018. Wei was accompanied by a 27-member delegation that included Air Marshal Dingqui Chang, Vice Chief of Central military Commission, and Lieutenant General Guiqing Rong, Vice Commander of Western Theatre Command (WTC). WTC is PLA's largest theatre command that controls China's entire border from Myanmar in the East to Afghanistan in the West. Fenghe had a meeting with Prime Minister Narendra Modi on August 21 had said he wanted the two countries to strengthen exchanges and cooperation between their militaries so as to jointly safeguard border stability and jointly maintain peace and tranquility; a repeat of what had been agreed between Modi and Xi at Wuhan. Fenghe then met his counterpart, Defence Minister Nirmala Sitharaman, which was followed by delegation level talks. 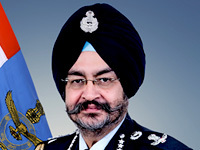 Both sides have agreed to draft a fresh memorandum of understanding (MoU) on defence cooperation and further expand the engagements between their armed forces; the official Indian statement saying, "It was decided to expand the engagement relating to training, joint exercises and other professional interactions." Both sides also decided to work towards a new bilateral MoU on Defence Exchanges and Cooperation to replace the MoU signed in 2006. Additional measures were also discussed for maintaining peace along the 3,488-km LAC, and it was agreed to work towards full implementation of ongoing confidence building measures as well as greater interactions at the working level to ensure the maintenance of peace and tranquility, including early operationalization of hotline between relevant departments of both armed forces. Delegation led by Smt Nirmala Sitharaman in a bilateral meeting with Chinese delegation led by General Wei Fenghe, Hon'ble Defence Minister of China. The meeting emphasized on strengthening Indo-China defence cooperation and strategic ties. China, which had earlier conveyed it wanted a hotline between the Chinese WTC Commander and the Indian Director General of Military Operations (DGMO), has now agreed for a hotline at the level of the Indian DGMO and a nominated officer at PLA HQ since PLA does not have DGMO appointment. However, China has suggested additional telephonic contact points that can address the multiplicity of issues all along the LAC; the suggestion being to keep interacting at multiple levels by commanders astride the LAC, and have a standard protocol for meetings and interacting. The need for hotline at DGMO level has been under discussion for a number of years. When it / these will fructify on ground is yet to be seen. India will perhaps also need to cater for interpreters especially for hotlines linking commanders at lower levels since some of the PLA commanders, if not all, may resort to speaking in Mandarin , which can have multiple meanings. The Chinese side proposed joint patrolling along the LAC but this was not agreed because there major portion of the border has become disputed because of illegal Chinese claims, besides the LAC is not demarcated on ground. Resumption of the 'Hand in Hand' anti-terrorist exercise between the two armies also came up during the meeting. Last year none was held because of the Doklam standoff; this year it is likely to be resumed in November. Opening up more meeting points at the LAC in addition to the six existing to hold sector-level meetings during tense situations like stand-offs to resolve the matter and celebrating national days of the two countries was also discussed. However, no decision was arrived at. Defence Minister Sitharaman raised the issue of development of border areas as water supply and electricity should not raise Chinese concerns. The Indian side also wanted China to have zero tolerance towards cross border terrorism. On handling contentious issues (like Doklam) both sides agreed for the need to handle with sensitivity, restraint, rationality and maturity. This bilateral meet at ministerial level was held one year after last year's Doklam standoff. However, it was the second meeting between Sitharaman and Fenghe this year, both having met in April during the Shanghai Cooperation Organization (SCO) meeting. 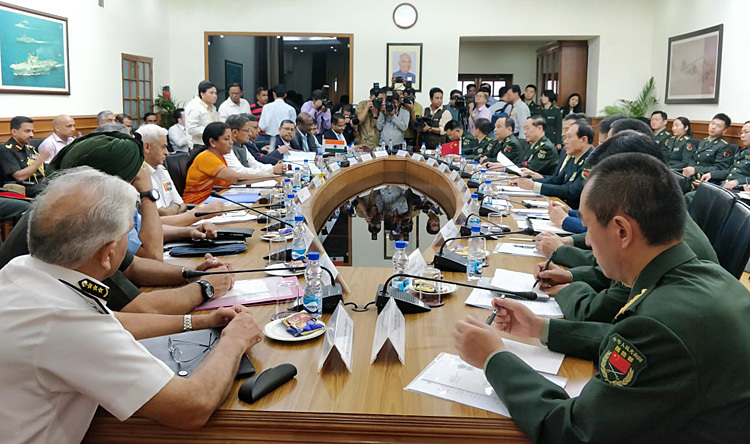 Before Fenghe's visit, General Liu Xiaowu, deputy commander of the Western Theater Command made a visit India in July this year and was reciprocated through Lieutenant General Abhay Krishna, Eastern Army Commander visiting China. Defence Minister Sitharaman is to visit China later this year. These interactions are no doubt good for India-China relations and building CBMs but the underlying problems continue to be the vexed border issue and the China-Pakistan anti-India nexus that also transcends the sphere of sub-conventional including terrorism. The sudden turn in China's stance also perhaps is because it wants India to somehow join the China-Pakistan Economic Corridor (CPEC) albeit this may be temporary. Of serious concern also is the massive Chinese defence build-up and infrastructure development in Tibet across the LAC, which also must be viewed in conjunction China's 'Coercive Approach' described in Pentagon's 2018 Report on Military Developments in China' as: "use tactics short of armed conflict to pursue China's strategic objectives through activities calculated to fall below the threshold of provoking." Analysis of this comparing it with Indian defence preparedness including lack of border infrastructure will indicate the considerable dominance (both physical and coercive) that China can exercise astride the LAC, particularly the areas it claims illegally. Ignoring this reality believing China has had change of heart can be disastrous. Indian policy makers must seriously debate the enlarging threat.